Building a small decorative fish pond is a great way to add a touch of the wild to your yard. One of the problems with prefabricated plastic-mold ponds, though, is that they don't always hold up well to the elements. They can crack or develop leaks in excessive heat. The same goes for the more flexible liners. They rip easily. 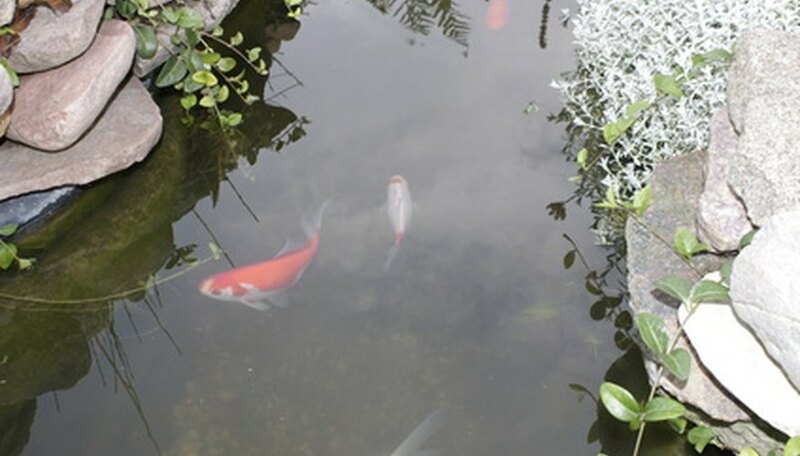 Concrete is by far the best material for the inside of a fish pond, as it is 100 percent durable and does not tend to increase PH levels of the water too drastically. Choose a spot to dig your pond. The ideal spot should have a mixture of sun and shade. It is okay to locate your pond near trees or a fence-line. However, keep in mind that large trees, in addition to possibly providing too much shade, also have extensive root systems. Large root systems will be more difficult to remove when you dig your hole. Mark the perimeter of your pond using painting stir sticks that are usually given out for free at places like Home Depot. Clear the marked off area of any debris like sticks, stones or leaves. Dig the pond. Begin by digging the perimeter first. The average pond size usually runs around 5 feet by 4 feet. However, if you have a specific shape or design in mind the exact dimensions may change. Average ponds also range from 2 to 3 feet deep. Once you have dug around the entire perimeter, then dig the pond itself. Try to slope the sides of the pond because the more slope you have the easier it will be later to pour concrete. Prepare the hole. You want the actual hole where the pond will be to be as smooth as possible before attempting to lay concrete. To do this, start by chopping away any roots at the bottom or on the sides with an axe. Use a hoe or a rake and the shovel to remove any excess loose dirt. Mix water and concrete mix in a wheel barrow or several industrial-sized plastic buckets. Use the instructions on the bag to determine how much concrete you will need to fill the bottom of the pond. For a 4 by 5 foot area, you'll need approximately 5 bags. Begin pouring the concrete across the bottom of the pond. You want the bottom to be at least 3 to 4 inches thick. Use a hand trowel to smooth the concrete at the bottom of the pond. Spread concrete along the sides of your pond using a hand trowel. You may want to use a little less water when mixing concrete for the side walls. A thicker mixture, along with good sloping sides, will make it easier to form the concrete sides. Allow the concrete to "cure" for 3 to 4 days and then add water and stock your new pond.